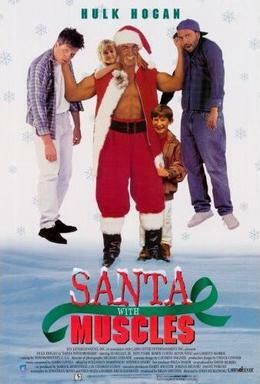 Santa with Muscles is a Christmas movie completely bereft of Yuletide, not to mention human spirit. It stars a fallen idol, one of our absolute favorites, Hulk Hogan. As a wrestler, we counted ourselves among his many millions of Hulkamaniacs. Oh, how the might have fallen (and shrunk). Hulkster was off the ‘roids during the filming of this thing and he’s noticeably more svelte here. Hulk is a celebrity pitchman (art imitating life) who is bonked on the head and thinks he’s the Jolly Olde Elf himself, Santa. He’s adopted into a family’s home and there’s an evil genius antagonist he has to thwart. Santa with Muscles is not noteworthy, but is notable for a few things: there’s one of the dads from That 70s Show, as well as a really young Mila Kunis! Along for the sleigh ride, an embarrassed Ed Begley Jr. and Hells Angels tough-guy Chuck Zito. 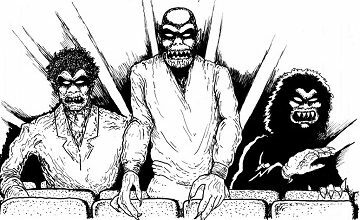 There’s a cameo featuring classic 80s wrestler Brutus “The Barber” Beekcake for those who are interested, even if those may only number 3. Speaking numbers, Santa with Muscles is currently a 2.4 on IMDb and unlikely to get any higher traction with this podcast, in which your intrepid hosts hoisted the eggnog and endured this piece of Christmas crap. Lumps of coal all around. We talk about wrestlers post-wrestling and how The Rock has fared versus his peers. We also reminisce about our favorite squared circle combatants.